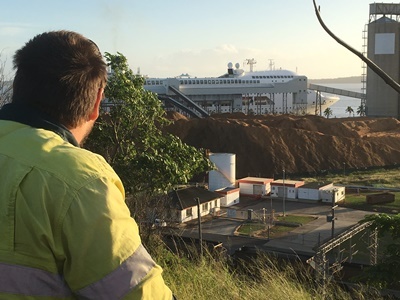 P&O Cruises’ Pacific Dawn has officially put Gladstone on the cruising map with the 70,000-tonne superliner today making history as the first cruise ship to visit the Central Queensland port. The call is the first of seven visits to Gladstone by Pacific Dawn and her sister ships Pacific Jewel and Pacific Eden this year, with the cruise line set to return to the city in 2017 on six occasions. The 2000-guest Pacific Dawn, which visited Gladstone as part of a four-night Queensland Sea Break cruise, was welcomed by the local community during a civic ceremony and presentation of the keys to the city. P&O Cruises President Sture Myrmell thanked Gladstone Regional Council and the local community for extending such an enthusiastic and warm welcome to Pacific Dawn’s passengers and crew. “We know from experience that our passengers best remember destinations by the warmth of the community welcome and Gladstone has certainly lived up to its reputation as a friendly city,” Mr Myrmell said. “Gladstone has so much to offer as a cruise destination. Australians are fascinated by the port’s nation-building industrial development, along with the beauty of the region as the gateway to the southern reaches of the Great Barrier Reef. Gladstone Mayor, Cr Gail Sellers, said Gladstone was very excited about the first arrivals by P&O Cruises’ ships, with Pacific Dawn’s visit today followed by Pacific Jewel on March 20, beginning a series of calls this year and next. “The cruise ships will be a great addition to the tourism industry in the Gladstone region. I join with our community in welcoming these impressive vessels along with the thousands of passengers that will be coming into our beautiful region,” said Cr Sellers. Seeing the sights of Gladstone and the beautiful Southern Great Barrier Reef in style on a 35-minute scenic flight to Heron Island before enjoying a snorkel on the fringing reefs and exploring the tropical island. Experiencing the Feast on East Market which showcases local art, handmade crafts and enticing cuisine, set in the beautiful East Shores Precinct within walking distance from the ship. Gladstone is one of a number of new cruise destinations in Queensland, which has the distinction of having more cruise destinations than any other state in Australia. P&O Cruises has added Moreton Island, Mooloolaba, Hamilton Island and Fraser Island to its cruise itineraries. Later this year, Cairns will become the first regional port in Queensland to homeport a P&O ship.